CARRY YOUR MEAL PREP CONTAINERS ANYWHERE - The leak-resistant lid is perfect for carrying your salad, soup or noodle anywhere! HEALTHY GUARANTEE: FDA approved, LEAD FREE and NON-TOXIC, lightweight but strong and durable. These lunch box bowls are microwave, oven, freezer and dishwasher safe. DON'T WAIT, GET YOURS TODAY! PERFECT FOR ALL TYPES OF FOOD - Designed to enhance the dining experience of Asian inspired foods (Thai curries, noodle dishes, dumplings, fried rice, stir fry, miso, lo mein, etc). With these beautiful bowls and chopsticks, your home cooked meals can feel like you are eating out at a fancy restaurant. Perfect for entertaining. Also great to use for salad, soup, cereal, and oatmeal. 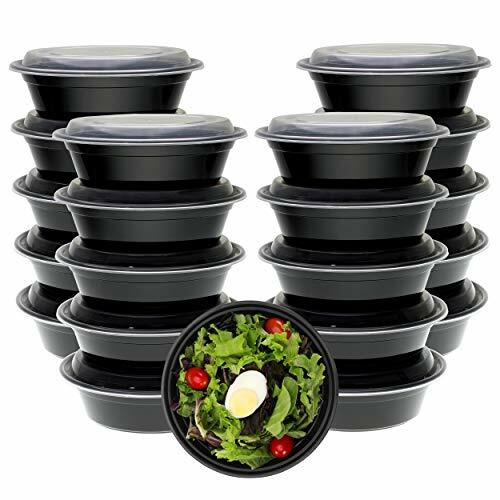 VERSATILE FOOD STORAGE CONTAINERS: The convenient dimensions (7.3" diameter x 2") and the thoughtful division of this set makes these reusable plastic food prep containers great for a variety uses, including restaurant & deli takeout, bento box for work, foodsavers, and are recommended by fitness experts for meal prep, portion control, and 21 day fix. Trust a 5-Star Product and the LIFETIME Replacement or Refund policy of Freshware. Order Yours Today!